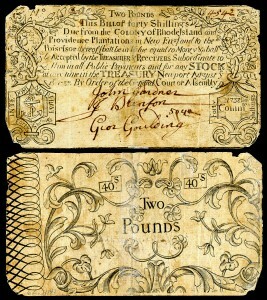 £2 Colonial currency from the Colony of Rhode Island. National Numismatic Collection at the Smithsonian Institution. Family historians reading about English or colonial money will see the symbol £ for pounds, and the abbreviation s for shillings and d for pence. All derive from the Latin: £ resembling an L for libra, a Roman unit of weight; and the d and the s for denarius and solidus, Roman coins. Sometimes a specific amount was written with those abbreviations, and sometimes a period was used to delineate each unit of currency: for example, £27 19s 6d or £27.19.06. In addition to pounds (also called “sovereigns”), shillings (“bob”), and pence, when reading historic documents you’ll see reference to other coins, including the half-sovereign (10 shillings); crown (5 shillings); half-crown (2s 6d); sixpence (“tanner”); threepence (“thruppence”); twopence (“tuppence”); half penny (“ha’penny”); and farthing (quarter penny). What were colonial currencies worth in today’s terms? Professor John J. McCusker has written, “£750 in Massachusetts during 1750 is worth roughly $48,000 in 2000,” acknowledging that this figure is an approximation. 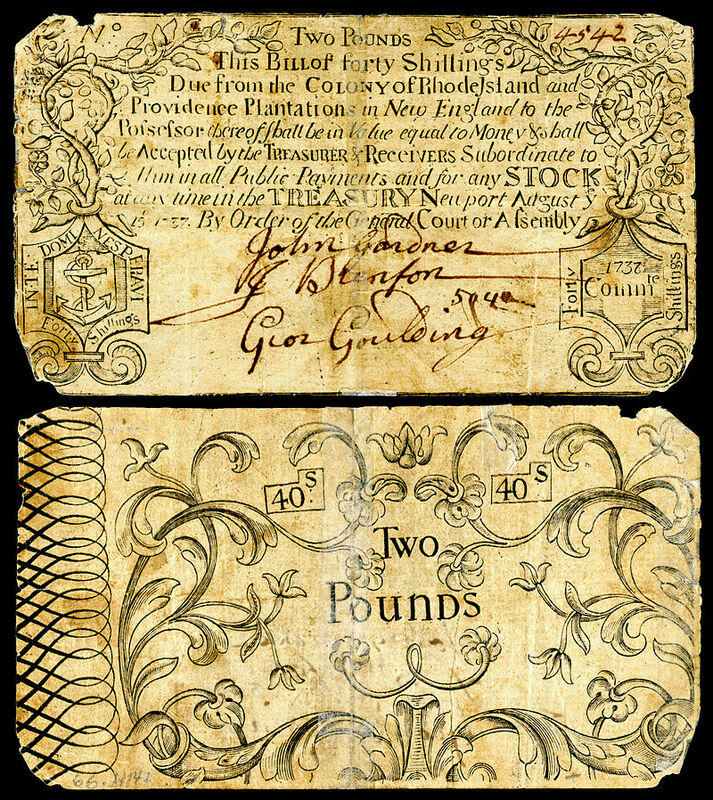 In fact, historians do not agree on a basic formula to determine the current value of colonial American currency, owing to a lack of complete economic data, the fluctuating value of imported goods, and the fact that each colony—while following the English system—had its own currency. Further, a colony didn’t produce its own coinage, using instead existing coins in circulation, from the Netherlands, Spain, German states, and other countries. As a result, many coins were valued differently from colony to colony. David Walbert, “The Value of Money in Colonial America,” North Carolina Digital History, www.learnnc.org/lp/editions/nchist-colonial/1646. John J. McCusker, How Much Is That in Real Money? A Historical Price Index for Use as a Deflator of Money Values in the Economy of the United States (Worcester, Mass. : American Antiquarian Society, 2001), cited in Ed Crews, “How Much Is That in Today’s Money?” Colonial Williamsburg Journal, vol. 2, http://www.history.org/foundation/journal/summer02/money2.cfm. Jordan Louis, “The Comparative Value of Money between Britain and the Colonies,” University of Notre Dame Department of Special Collections, available at http://www.coins.nd.edu/ColCurrency/CurrencyIntros/IntroValue.html. Estate of Daniel Austin, Essex County Probate Records, online database at AmericanAncestors.org, Case no. 1011. When I traveled in the UK in the 1980s, I found the old system of pounds, shillings and pence very confusing. I could get the right number of pounds, but beyond that, that I simply had to trust shopkeepers to hunt through the change in my hand to pick out the right coins. Recognizing my American accent, everyone was very patient with me, but I’m sure a few were amused, bemused, or contemptuous once I was gone! I never had the sense I was being cheated, at least. Rationalizing the system to a decimal system made a lot of sense. While I agree that exact comparisons of money values over time are iffy, I think that with enough reading of old documents and books on colonial life, one can get a “feel” such that internal comparisons within similar areas and time periods are possible, even if they can’t adequately be made with modern times. For instance, in a particular will, it’s easy to compare who gets more and who gets less. I have some family wills, for instance, where there were large numbers of children, and the money didn’t always go to the oldest son, nor did the property, real estate or other, go as one might have expected. That’s valuable information, regardless of the comparable value to today’s money. Thank you. I appreciate this. What is a “buck”? Were there French or Spanish money used? Yes, at times, Spanish and French money was used especially prior to the establishment of an official mint. There was a Boston Mint from 1652 to 1682, however, as you might figure, it is difficult to distribute coins across great distances especially in those times, so colonists used what was available. I think you must have been in England before 1971, because in that year on 15th February Britain went decimal. (I know because it was my nineteenth birthday!) What a relief! You haven’t lived until you have had to add up in your head items in pounds shillings and pence! I used to work in a shop as a Saturday girl when I was 14, and everything was priced £1 19s 11d or whatever. The mental arithmetic needed to remember there were twelve pence in the shilling, but twenty shillings to the pound! I cheered when they brought in decimal money! Thank you so much for this post- it has answered a number of questions I have had for years. Also appreciate the sources listed to read for more information. As it has a glossary of commonly used terms from the Colonial Era for money and also provides more information. Looking a little further back in England, I’ve come across mention of the Noble, equal to 6s. 8d., or 80d. This is the same as 1/3 of a pound, and in New England wills I’ve seen a bequest of 6s. 8d. a number of times. I guess the idea of the Noble hung on even after there wasn’t an actual coin any longer. This is very helpful. I have ancestors who lived in the late 18th century, and I found it very confusing when they used a variety of currencies. Thank you. Reference Henry’s and Walter’s notes, the Guineas and Nobles were coins of gold, thus their rarety. Thanks, Zach, for an interesting article. Perhaps one of the most common “monies” was the Spanish 8 real piece which was readily divided into eight pieces. This “dollar”, being divided, became 2 bits for 1/4 dollar, which remains to this day “shave and a haircut – 2 bits”. The value of anything still depends on supply and demand, or what amount someone will pay.
. Dr. Ambrose Howard, a physician, practiced medicine in Sidney, Maine from 1802 to 1834. [Marriner, Ernest C., Kennebec Yesterdays, (Waterville, Maine : Colby College Press, 1954), p. 131].
. Marriner, Ernest C. Kennebec Yesterdays (Waterville, Maine : Colby College Press, 1954), p. 139. See also the similar discussion on p. 120. Thank you for the interesting article on Colonial money. I have ancestors that lived in Rhode Island at the time the pictured money would have been used as well as others living in Massachusetts. Being Canadian I knew we had used the British money for some time. Actually Canadian money was minted in England up until 1905 or beyond. Until reading your article I wasn’t aware when the dollar was established. Now living in the UK I am familiar with the £ as well as coming to grips with the Euro. I came across the word “old tenor” numerous times in colonial wills. What does this mean ? negative impact on business and trade, I would think.